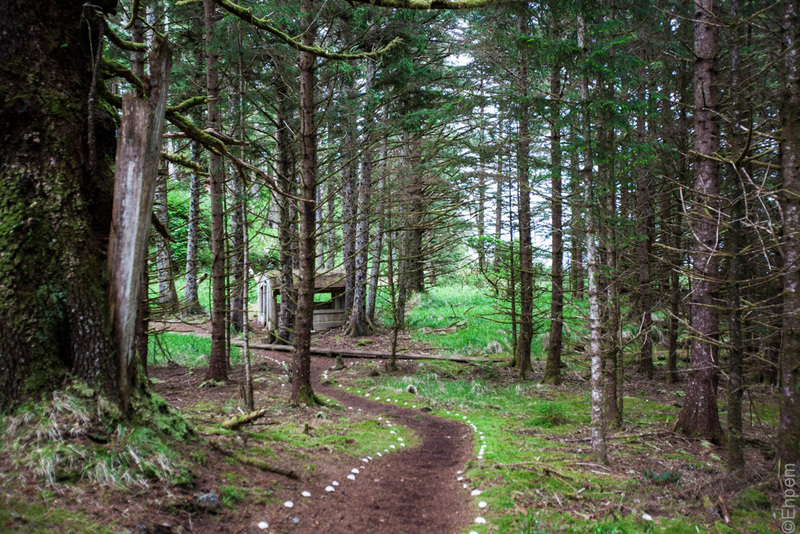 A path that leads to a viewing area at the back of the Kunghit Haida Chief Ninstints’ house at SGang Gwaay. The wood on the left sticking out of the spruce tree is one of the rear corner posts of the house. The spruce nursed on the top of the post and then grew around and through the post splitting it apart, ejecting some and swallowing the rest. The small structure is a shelter for visitors that is adapted from the design for a small Haida house, or a large grave house. I was visiting while on a tour of Gwaii Haanas aboard the Passing Cloud. it looks like someone has lovingly place those rocks along the path. Hi Selah – welcome to my blog and thanks for commenting. Those are clam shells and they are lovingly placed to demarcate pathways in order to minimize impacts to the site. They are a brilliant solution as they are visible even in very low light, they can be obtained off some beaches or from canneries for nothing, and they are local and do not make a significant impact to the underlying archaeological deposits – some of which have shell in them, but few of which have whole butter clam shells (it is mostly mussel and barnacle shells in sites in this area). thank you for the explanation, where exactly is this? I live on Vancouver Island, do you need a boat to visit? Hi selah – this is on the southern end of Haida Gwaii and you do need a boat to visit.